South Park's Facebook page received a new trailer for South Park: the Stick of Truth today which showed a lot of promise. The trailer showcased gameplay both in and out of combat. Watching an elementary schooler beat another kid with a bat until he bleeds is exactly what I'd expect from a South Park game. As long as there are a good variety of these abilities in the final game I could see the battle system being entertaining from its hilarity alone. One of the battles even included Jimmy as a bard singing dirty songs to power up his allies. And I don't know why I was worried about how the game would look while exploring; in classic South Park style the characters just jitter along with all the animation budget of a kindergarten stop-motion movie project, so it's perfect. The end of the trailer ended up on quite a down note, though, with a new release date announced for March of next year, instead of the previously-announced December of this year. According to a post on Ubisoft's blog the creators of South Park are excited to see how this game is coming along: "We always wanted the game to feel like you’re actually in an episode of South Park,” say Matt Stone and Trey Parker “Getting the game up to the crappy standards of the show has been a real challenge and we’re excited to say it’s taken way longer than we thought it would." Just in time for everyone's favorite pumpkin-related holiday, Ubisoft has announced the addition of five Smashing Pumpkins tracks to Rocksmith 2014. Included in the pack are five of the band's biggest, mid-90s singles. "Today" and "Disarm" originally appeared on 1993's Siamese Dream, while "Tonight, Tonight," "Bullet With Butterfly Wings" and "1979" hail from 1995's Melon Collie And The Infinite Sadness. These songs join "Cherub Rock," another cut from Siamese Dream already featured in Rocksmith 2014. The Smashing Pumpkins DLC pack is currently available for download from either the Xbox Live Marketplace or Steam. A PlayStation 3 iteration of the DLC is due on November 6. Each song can be purchased individually at $3 a piece, though if you pick up all five new tracks at once you'll only spend $12. 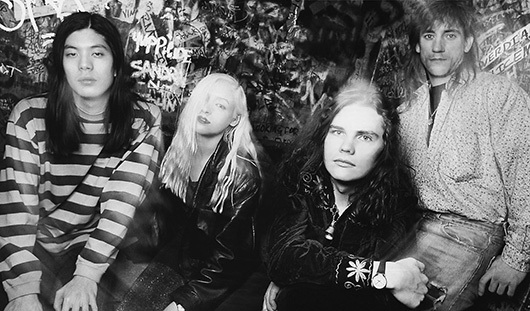 Smashing Pumpkins DLC adds Disarm, 1979, more to Rocksmith 2014 originally appeared on Joystiq on Thu, 31 Oct 2013 17:00:00 EST. Please see our terms for use of feeds. The second chapter in the Castlevania: Lords of Shadow saga, the 3DS's Mirror of Fate, brought the series closer to its roots than it has been in years. Side-scrolling action made a comeback, with a small amount of Symphony of the Night-style exploration in tow, but it also maintained the combo-driven combat established in the first Lords of Shadow game. The combination of the best elements from different corners of the series worked well, and the reimagining of the connection between the Belmont family of vampire hunters and Dracula provided an interesting if somewhat predictable twist. Unfortunately, a small number of design choices got in the way of the good stuff, but in porting Mirror of Fate to consoles, Konami had a chance to finally fix those failings. Mirror of Fate goes further than the expected visual upgrades, making small improvements that lead to a much more enjoyable experience. The story in Mirror of Fate picks up after the conclusion of the first Lords of Shadow and follows the paths of three characters: Simon Belmont, his father Trevor Belmont, and Alucard. Each of their stories is told separately, but these threads weave together by the end of the game. Unfortunately, due to the heavy hints laid out in the beginning, the intended element of surprise ultimately falls flat. Plot aside, Mirror of Fate is a straightforward affair with few innovative constructs, but what is there feels tight. With your map and its handy objective icon, you navigate the halls of Dracula's castle, fending off zombies, seething, skull-headed rat-dogs, and undead knights, with an occasional challenging boss fight along the way. It isn't tricky to maneuver through the castle, but a plethora of platforming sections keep things interesting. The character's whip-like Combat Cross let's them grapple and swing from chandeliers and broken bits of castle, then flow into hand-over-hand climbing sections where you have to leap over chasms before pulling yourself up to solid ground. The orchestration of these sections present a reasonable challenge, but more importantly, you feel like you're exploring the depths and heights of Dracula's castle, rather than sticking to plain paths laid by hallways and staircases. The three-character setup is an interesting method for storytelling, but it also allows for a bit of variety in play styles. That's not to say the Belmonts and Alucard are wildly different from one another, but each comes with a slightly different repertoire of movement and attack abilities. Regardless of the character in question, the game's combat system makes it easy to string together a series of direct and area attacks, well-timed blocks that can stun enemies, and evasive maneuvers. Thanks to the tight, responsive controls, it's easy to mash your way to victory, but every encounter provides opportunities to demonstrate mastery over the nuanced timing and complex commands. None of this has changed for the Mirror of Fate HD update, where the most obvious changes are in the visuals. It's not immediately apparent which textures or models are old, but what's here shines on a larger, clearer display. Mercury Steam's beautifully twisted gothic designs for Mirror of Fate finally get the presentation they deserve, and though the in-game models appear rough around the edges compared to console-native games, Mirror of Fate HD's presentation is surprisingly strong. What is a man but a happy pile of secrets? Wait, is that right? Interestingly, the graphical boost isn't the only difference between versions of Mirror of Fate. Least of all, the controls have been loosened a bit, allowing you to use the D-pad to control your character. Beyond this, the most important change is the removal of the vast majority of quick-time events. When I reviewed Mirror of Fate the first time around, I lamented the fact that the game constantly shoved in quick-time events. Want to open a treasure chest? Get ready to tap the A button a dozen times. Ready to deal the final blow to a difficult boss? Prepare for a series of button presses that can't be missed. In both scenarios, you've proven your abilities and shouldn't be subjected to laborious inputs for the mere sake of it. In most instances, quick-time events have been removed from Mirror of Fate HD in favor of allowing the action or cutscene to progress without further input. These are small changes, but the latter has far-reaching implications on the game at large. I no longer view Mirror of Fate as a good Castlevania game plagued by annoying design issues. Now, in the case of the HD port, the positives rise to the surface rather than the negatives, and Mirror of Fate finally feels like a great addition to the series. It has the most intriguing story in any Castlevania game to date, even if it is a bit predictable, and the emphasis on combat above exploration is a fair trade, primarily because the combo system is so fluid and sports a good amount of depth. Mirror of Fate on the 3DS may not have been the side-scrolling, vampire-hunting adventure that we all hoped it would be, but with its heightened presentation and revamped mechanics, Mirror of Fate HD is a big step in the right direction. Ubisoft's Uplay Passport, a one-time-use code in new games that grants access to online features, will not be included in any future games and is being stripped from Assassin's Creed 4: Black Flag. "The Uplay Passport program was initiated as a means of giving customers full access and support for online multiplayer and features, along with exclusive content, bonuses and rewards," Ubisoft writes. "However, games today are blurring the line between offline and online, between what is 'single player' and what is 'multiplayer.' Based on that and on the feedback we received from you, we recognized that Passport is no longer the best approach for ensuring that all our customers have the best possible experience with all facets of our games." Uplay in Black Flag restricted single-player access to the game's fleet management system, Ubisoft confirmed. Ubisoft is eliminating the cost of the Uplay Passport in Black Flag - those without one can download a code for free via Xbox Live or PSN, and those who already bought one can contact regional Ubisoft support for more information. Ubisoft cans Uplay Passport for all future games, starting with AC4 originally appeared on Joystiq on Thu, 31 Oct 2013 16:37:00 EST. Please see our terms for use of feeds. Spark Unlimited, Team Ninja and Comcept collaboration Yaiba: Ninja Gaiden Z has been pegged for a March 4, 2014 launch in the US on Xbox 360, PS3 and PC through Steam. 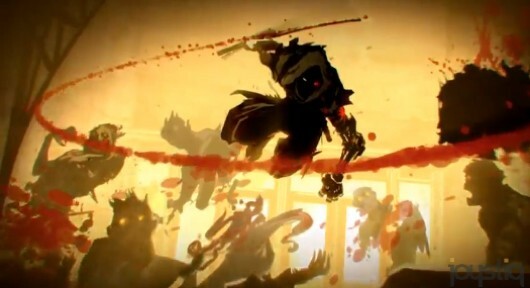 Yaiba: Ninja Gaiden Z centers around anti-hero Yaiba Kamikaze - a ninja who massacres his entire clan for perceived weakness. After dying by the hand of Ninja Gaiden series protagonist Ryu Hayabusa during a duel, Kamikaze is then resurrected as a cyborg by a mysterious corporation, which forces him to embark on a quest to quell a zombie outbreak in exchange for the power to enact his revenge on Hayabusa. Team Ninja told Joystiq back in August that the Unreal Engine 3-powered slash-em-up is its own thing - not a spin-off or sequel. Team Ninja went on to say it would love to pursue a sequel, granted Yaiba: Ninja Gaiden Z manages to find an audience. And if the latest trailer above is any indication, that target audience is folks who enjoy terrible, cringe-worthy euphemisms. Yaiba: Ninja Gaiden Z pits cyborg ninja against zombies next March originally appeared on Joystiq on Thu, 31 Oct 2013 16:00:00 EST. Please see our terms for use of feeds. The official Smash Bros. website has been posting new images of Super Smash Bros. for Wii U and Super Smash Bros. for 3DS every weekday. Many of them are simple or humorous pics, but today's is different - it introduces the Male version of the Wii Fit Trainer. Given the matching poses in the picture and the lack of a character page dedicated to the Male Wii Fit Trainer, it is likely that he will be an alternate skin for the Female Wii Fit Trainer, who was revealed back in June at E3. It would be the first time alternate skins appeared in a Super Smash Bros. game, with Wario's classic costume in Super Smash Bros. Brawl being the closest the series has gotten in the past. For now, the only picture of Male Wii Fit Trainer is for the Wii U version, so it is unclear if he'll be in the 3DS version of the game. Check out this trailer for Super Motherload, releasing November 15th alongside the PS4 console. 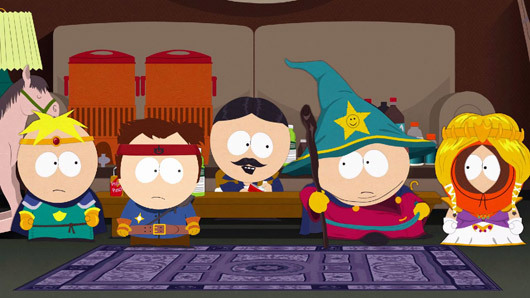 South Park: The Stick of Truth has been delayed to March 4, 2014, Ubisoft announced today. The game will now launch on March 6, 2014 in Europe. Ubisoft acquired the game when it purchased THQ Montreal in January, later announcing that the game would arrive this holiday season. "Within three weeks after acquiring the game, we sadly realized we had to turn this thing upside down if we hoped to deliver the experience everybody wanted," Ubisoft North America's president Laurent Detoc said in the announcement blog. "It's been such a major overhaul to get to the point where we are that we couldn't let it go, even if that meant missing December." Ubisoft also unveiled a new gameplay trailer for the game, which clocks in at over seven minutes long. South Park: The Stick of Truth delayed to March 2014 originally appeared on Joystiq on Thu, 31 Oct 2013 14:30:00 EST. Please see our terms for use of feeds. There has always been a sinister underbelly to Pac-Man's maze adventures. Like an unaltered version of a Grimm fairy tale, the Pac-Man games exist in a world in which he must constantly consume ghosts until he is eventually overwhelmed by the relentless determination of his poltergeist pursuers. But it was easy to ignore this endless endeavor when abstract visuals shielded you from the worst of Pac-Man's deeds. After all, how could a yellow circle eating colorful doodles possibly be ominous? And the eyeballs of your eaten foes--those shocked, disembodied eyeballs--drifted back to the ghost hideout like a silly gag. Prepare to have your happy memories turned on their heads. In Pac-Man and the Ghostly Adventures, the abstract barrier has been removed, and in the process, there's a surreal wrinkle to this entry-level platformer. Who knew that Pac-Man had a dark side? A benign introduction welcomes you to the city of Pacopolis. Characters loudly enunciate their lines as if they belong in a Saturday-morning cartoon, and the dialogue never ventures outside of the dry exposition that pushes the plot ever onward. For those who enjoy A Game of Thrones, it can be funny to imagine that Sir C is really Cersei Lannister, though the big-nosed professor isn't quite as ruthless as the queen regent, at least not as far as we're shown. A school serves as a hub world for Pac-Man, and though that's hardly strange given that he's just a boy in Ghostly Adventures, the company he keeps begins the surreality that flows throughout this game. Pinky, Blinky, Inky, and Clyde--the ghosts from the original Pac-Man--roam the halls as if they aren't spirits, and you talk to them instead of trying to eat them. It's nice to know that even the fiercest of enemies can make nice. That Pac-Man sure is full of hot air, huh? At this point, it seems as if Ghostly Adventures not only caters to a young audience incapable of discerning thought, but doesn't even respect them. Because the dialogue lacks any semblance of wit, there's nothing more to the plot than a remedial MacGuffin hunt, and the by-the-numbers platforming continues along that brain-dead path. Early levels set you loose in 3D worlds with nary a hint of interesting obstacles or clever level design. You simply walk along the constrained route, collecting pellets and hamburgers just to have something to do, and then mash a button to eat ghosts who stand before you. There's a certain appeal in chomping a group of ghoulies in a flashy display of your insatiable hunger, but everything is so by rote that it's pretty dull. It's as if the game expects the inherent fun of playing to drive you forward, even though there is nothing worthwhile going on. And then, things start to get more interesting. Who put a vending machine in a frozen tundra? Pac-Man is a chameleon, and that's not just a figure of speech. Special pellets transform you from a double-jumping eating machine into a variety of creatures that give you different powers. As a chameleon, you can swing from poles using your sticky tongue and turn invisible to make it past searchlights. When Pac-Man becomes a giant boulder (complete with an indecent retractable nose), you can squash the baddies who are terrified of your girth and shoot off ramps like a pinball. Gobble a pink pellet to fill yourself with air and then coast along the currents. Ghostly Adventures injects variety into your escapades through these precious pellets, and thus raises the insulting early levels to a place of respectability. None of these specific elements are particularly well executed on their own, but simply rushing from one objective to another keeps you on your toes so you're always reacting to a new demand rather than being lulled to sleep by predictability. Rushing from one objective to another keeps you on your toes so you're always reacting to a new demand rather than being lulled to sleep by predictability. These powers have a positive impact on the combat. When you become imbued with fire or ice energy, the ghosts keep pace, and you need to use your elemental abilities to stop them. How else could you devour an ice ghost if you don't set it on fire first? Having to put thought into dueling ghosts keeps you engaged in ways that evaporate when you're just slamming on the chomp button. Still, the raw mechanics aren't so hot. Targeting specific ghosts with ice and fire projectiles is tricky, especially when there are teleporting and vomiting ghosts floating across the environments. This imprecision removes much of the skill that could have made conquests satisfying, so instead, you partake in fights of attrition where you hope you nibble every baddie before they chip away all of your health. Because it's so kinetic, combat doesn't become boring, but it merely serves as another dose of variety rather than an enjoyable activity in its own right. Pac-Man seems ambivalent even surrounded by searing-hot lava. It's in the platforming that Pac-Man reaches its potential. There are so many ways to navigate these colorful worlds that you're always doing something different, and that alone keeps you invested. Zipping across vanishing platforms is very different from walking vertically along magnetic columns, and that not only nicely mixes up your actions, but also pushes the levels to new places. The tired designs of the early levels fade away when you have to figure out how to cross a lava lake (freeze the geysers!) or reach that floating island (find an air draft!). All of these elements have been found in previous platformers, but that doesn't diminish their appeal here. Zooming through a tunnel on a crumbling piece of rock is still fun because you have to think fast as obstacles rush toward you. And the repulsive way that Pac-Man just shoves any old thing into his mouth is good for some gross-out chuckles. And the repulsive way that Pac-Man just shoves any old thing into his mouth is good for some gross-out chuckles. Through all of this ridiculousness is the surreal undercurrent that flows through the game. Pac-Man eats ghosts, it's what he does, but there's a joy to his consumption that's unsettling. He eats the entire spook (those eyeballs no longer escape), and then keeps track of how many eyes he's digested. It's a little unnerving. After playing through every level, I have eaten exactly 2,426 ghost eyes. How could Pac-Man pal around with Pinky, eat her kin, and keep a morbid running tally of his conquests? And your victory animation when you nab the fruit at the end of each level cements just how twisted this game can be. When Pac-Man burps as any foodie would, you can actually see the eyeballs in his mouth fumes. It's as if the game repeatedly wants to remind you exactly what Pac-Man (and, by extension, you) are doing, so your actions swirl in your head even when you go to sleep for the night. See how you like being eaten by a monster. The creepiness continues in the four-player mode. Here, you and up to three friends embody ghosts in 3D representations of the classic Pac-Man mazes. Explore the labyrinthine passageways as you nab fruit and collect power-ups, all while a computer-controlled Pac-Man roams, hungry for ghosts. You may find the pellet muncher near the north corridor, and you rush toward him with unwavering focus. Now is your chance to put that Pac-Monster in his place. And then he nabs a power pellet, turning you and all of your friends blue, and devours you whole. Except your eyes, of course. You're sent back to your hideout as just a pair of eyes, and you realize how scary it is to hunt Pac-Man. Sadly, this mode is much better in concept than in practice. It's a slow-paced affair that lacks the unpredictability that could have made it engaging. Still, it's enlightening to see the world through the eyes of your long-standing enemies. Pac-Man and the Ghostly Adventures travels down the same road as so many games before it, and neither the combat nor the platforming engender enough excitement to raise this beyond mere respectability. But its competency is welcome, especially considering the dearth of 3D platformers currently out there. Anyone who has spent hours partaking in upper-echelon adventures such as Super Mario Galaxy 2 or Ratchet & Clank Future: A Crack in Time will find little here to hold their interest, but as a "my first platformer," this is a fine place to start. Just don't expect to ever again view Pac-Man as the noble hero he once was. The PlayStation 3 got an exclusive action title called Heavenly Sword back in 2007, but, despite persistent rumors, the game has yet to receive a sequel. What it will get, however, is a CG animated movie based on the 2007 title. Producer Brad Foxhoven took to the PlayStation Blog to talk about the film. Heavenly Sword is a dramatic tale of revenge that sees Nariko (Anna Torv), a fiery red-haired heroine, embark on a quest of vengeance against the invading King Bohan (Alfred Molina) and his army. Once considered the failure of a legendary prophecy, Nariko must wield a sword that was ultimately meant for another. This ancient Heavenly Sword, once belonging to a powerful deity, can never be wielded by a mortal without slowly and inevitably killing them. For Nariko, it’s a race against time to avenge her clan before her life is irreparably overtaken by the omnipotent Heavenly Sword. Foxhaven also adds in the comments section that the movie is "true to the game’s mythology with one exception".